The slim yet robust design of the EVS Revolution 5 Under Jersey Roost Deflector is created with a mix of strategically placed impact panels, expanded foam support pads, and an articulated assembly. This means you get a low-profile deflector that mimics the movement of your body while still being able to take a serious hit. Even with this rigidity, EVS keeps you comfortable by making the Revolution 5 lightweight, vented, and fully adjustable. 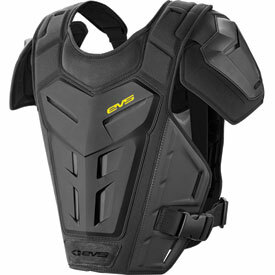 So if you dream of a chest protector with more safety and less bulk, make it a reality and pick up the EVS Revolution 5 Under Jersey Roost Deflector. Everything about it is great, I just wish that it had straps that went around the arm to hold the piece in place. I like, provides me the protection I need in my mid section from roost or foot pegs. I'm 220lbs, so it doesn't wrap around my torso as much as I like but that's just part of being big. Light weight, don't even know its there, lets air flow well. This is a cheap chest protector. Not super satisfied. The hard plastic doesnt cover much of your check and hardly any of the back. The shoulder pad just velcro on. Very thin without much back protection. Very thin without much back protection. Shoulder pads do not have straps to hold in place. I will probably return. Sleek under the jersey design that isn’t too bulky and seems to keep me cooler than over the top style. It’s also much more comfortable, with no sharp edges to dig into my neck and does not interfere with the hydration pack that I carry when riding. Though this comes at cost, as it does not feel very substantial and it will probably have you wondering how thin plastic and foam runs $80+. It is nice and light. I am a 5'8, 130lb slim woman and I ordered the youth small/medium. The fit actually worked out well for me, but if you have a large bust size you would definitely want a larger size. The velcro shoulder pads are okay-it would be nicer if they felt more secure when not wearing it under a jersey. As a women this does not fit at all, and is very uncomfortable. This is intended to be for men. We do offer women's roost deflectors and they will have a more comfortable feel. First day using it crashed into a tree and bruised my ribs, probably helped hard to say. I’m 6’ 190lbs and it’s a little snug at its loosest setting, think if I was fatter it might be a little to tight so I can’t gain weight now. Over all nice roost deflector. Shoulder pads Velcro on and so you can move them right were you want them. From the web site ordering to the delivery time and fit was very impressed. Great fit, a lot more comfortable than traditional chest protectors. Provides more maneuverability with just as much protection. Works great with collars! I have had other EVS roost deflectors in the past but this one is my favorite. Super lite and not bulky like other brands. comfort is a must and this does it for me. Fits snug but is adjustable. Overall a great under jersey setup. Doesn’t feel bulky, hardly notice it’s on. This is a nice roost deflector but plastic protection is a little small in size. It does fit comfortably and most importantly works well with a neck brace. I have the evs neck brace and wanted to make sure I had a chest protector that would work with it. Nice overall. Great fit and really comfortable when riding. One of my best busy yet from Rockymountainatv.com! A little bit less protection than I had been hoping for. It’ll help with the little bits but offers no protection otherwise. Very nimble and comfortable. Fits true to size no complaints. I wear over jersey instead of under and seems to fit better that way. Fits my 11 yr old son who really wanted to try an under the jersey style chest protector. Great Price! Hardly even realize I'm wearing it under my jersey! Good deal for price , just enough coverage. Good fits high on chest best worn under jersey due to shoulder pads bounce in the eind. Good protection, lightweight, I would recommend it. My fox raptor chest protector got stolen. I was looking for something lighter that would go under the Jersey. I am 6'3" 210# I really like the feel of it, it's hardly there I do wish however the shoulder straps were a bit longer. If you want protection but not the bulk I would give this a try! It's lightweight, but the arm protectors don't have any strap, so they flop around a lot either inside or outside my jersey. It does work well with my Atlas neck brace. I think it should be cheaper. Very comfortable ! True to size, can move around well while wearing. Nice and thin but still enough protection. I wear this as a under jersey, and have no issue with the shoulder pads. It's comfortable, and provides decent protection. Probably made from the same material as Batman's suit. Fits nicely under my jersey. Normally in the super competitive over 50 novice class, I can lead from gate drop to finish but I often encounter lappers -this is where this Roost Deflector comes in handy. This Is not only best bang for your buck it keeps u safe and keeps ur day rolling and after as well. I've purchased this oroduct once and luv the design. Yes it can ride up but under jersey is best for it. I have not gone riding with out it and recommend this to any rider out there. I soon will be purchasing one for my son. Size fits good and luv that shoulder pads do remove which is nice if u just want to be more free. EVS I I've u guys a 10 on ur gear. I like the concept of medium armor under jersey fit. Seems light and well made. But the two sizes are only 0-120lbs, and 120lbs and over. They need a third size for adult men. Really only 120 lbs? That is like the weight of a 6th grader. Wow. Gotta send it back. It is extremely light weight and fits well. Only thing l would do is make the straps over the shoulders a little longer. I'm 6 feet 2 inches and it's just long enough to fit length wise. I bought this for my son. He is 6'1", weighing in at 170. We ordered the Large/XL. It fits great. I was concerned about wearing a backpack/hydration pack while wearing this. It works fine and is comfortable. This is a 1 day of riding review. I wanted a under the jersey protection(limited protection), never did like the bulky chest protectors so I decided to try the EVS 5 under the jersey roost deflector and as the name states, it is a deflector(limited protection) not a chest protector. Anyways, after a day of riding, I can say that it was very comfortable, forgot I even had it on. I use it for trail riding.My size was the LG/XL. I wear a XL shirts. Now that I'm getting older I figure some protection is better than no protection. As far as durability goes, time will tell but with my EVS knee and elbow pads, which just happen to be EVS, they are going on 10 plus years. I do think they are over priced at $80. Price is right and the fit is nice. I don't even notice it while riding! Only thing it is a little thinner than I thought it would be. Makes me wonder about the protection it will provide in a crash. Would recommend for comfort, but haven't tried out the protection qualities yet! Bought this for my daughter, this fits well under the jersey, although it does fit slightly snug, and doesn't ride up like other chest protectors she has owned. I had to take the shoulder pads off for her as they were a weird fit. Otherwise I would recommend this product, it has a lot of protection. Affordable, fits great, flexible, fits great under jersey. Protects from roost not stiff and bulky. Like the chest plate of iron man!! Good product, but less protection. I wear it on non-race trail rides and endure racing and it is very comfortable and provides adequate light weight protection in that kind of situation. I do not wear it for hare scrambles where the odds are greater that I will be following closely riders throwing up significant roost. bought this so i could look cool showing off my jerseys. i enjoy how it works well with the lesser expensive EVS neck brace too. I Really Like this piece of Gear, much better then what I was Wearing before, (sorry Fox) I Kept hurting my Ribs in my old Under Jersey Roost Deflector, so I knew it was time to upgrade or do something because I just can't keep getting Hurt & laying around waiting to Heal up, I ordered these & what a difference in the level of Protection, others can say what they want BUT this Gear REALLY Works! thanks EVS & Rocky Mtn. Minimal coverage,but works well and fits nice. size was spot on. not bulky provides "roost deflection"
this is good for what it is advertised. not as much protection as a beefy chest protector but thin and lightweight. How well does a hydration/backpack work while wearing this? BEST ANSWER: I wear a hydration backpack regularly with this roost deflector...fit and operation is very good. This roost deflector is not "bulky" in any way and is comfortable to wear even with a backpack, while providing moderate protection. I do not wear the removable shoulder guards, but that's personal preference only and not because of fit with my hydration backpack. I wear the roost deflector and wear a camelpak over and it's never been an issue. I wear the roost deflector over a T-shirt and then a jersey over that. I don't wear the shoulder pads. I wear my camelback and the roost deflector at the same time without any issues. Great. I wear a hydration pack over this EVS roost guard every ride. It works great. Almost like it isn't even there. I haven't tried but I think I would work fine. works just fine, under or over jersey. Is this compatible with an Atlas neck brace? BEST ANSWER: All though I don't have a atlas neck brace I do have a alpinestar neck brace and it fits. The roost guard is so low profile I don't even notice it while I'm wearing my alpinestar. I don't wear a neck brace. But I would think it would work fine. Can hardly tell it's even on. It's fairly thin but gives good protection. I've had mine for 2 years now. I don't wear an Atlas brace, but there is quite a bit of room in the collar area. I should'nt be a problem. I'm 5'11" and 135 lbs what size should I get? BEST ANSWER: Depends on how broad your shoulders are and your chest "girth". I'm 5'11", but weigh 225 lbs and wear a 48" suit coat, therefore I bought the largest size. One size below would likely fit you well in the shoulders. Im 5'9 170 and I got a large/xlarge and ran big so I would go for the smaller size. Its not huge or anything I still use it, but only when I need to cause i cant get annoying sometimes. I would get the large/xlarge. I'm 6.0 and weigh 250 it fit like a bib but does a good job! I would suggest getting the adult large, as it allows you to adjust it to the right size. If you use it under the Jersey go with a size Medium. BEST ANSWER: I am pretty sure it will fit. This is a great roost deflector, I race off road and wear this for long periods of time with no problems. Stays in place with no rubbing. Yes, my son wears this protector with his Altlas neck brace and it fits well and he's 13 and 135 lbs. Do you guys not have an adult small/medium, or is the Youth considered the small/medium? BEST ANSWER: If your looking for an Adult S/M size this should fit just fine. I usually wear a large (5'10-185 lb) and it was to small. I'm 150 pounds and the adult fits fine after adjusting the straps. I'm around 6'1 and weigh about 160 I should get the large Extra large right? Also I'm I guess you could say slim/skinny and I want to have a really good fitting under jersey, any suggestions if I should get the evs revolution 5 or a different one? Yes, I believe that is the size you would want. I'm 5'6" and 175 and have the L/XL. I will say I really like the chest protector and would recommend it. I am about the same build as you and this fits nice under my jersey..(large-x large) I like it so much I bought 1 for my 12 year son. I'm around 5'11 and weigh about 185 and I use size large. I'm guessing you should be a large. I haven't tried any other types. im 5'8 and 190 large fits perfect. protector has several adjustments for fit. I wear mine under jersey and works great! Definitely extra large. I'm 6'2" 190 and at a little small for me so should fit you well. Are the shoulder pads removable? BEST ANSWER: The shoulder pads attach with a Velcro strap. You can easily remove them, or move the in or out by how you attach the Velcro strap. Yes, they’re attached with Velcro. Yes sir. They Velcro on and off. I’m around 5’8- 5’9 around 130lb. What size should I get? BEST ANSWER: According to the EVS size chart, an adult large/xl should work for you. I'm 5 10" 155 and got the large. I think you will be fine with a large. It's not big and bulky like others. pounds what size would fit me the best? BEST ANSWER: I would go with med. The waist straps are adjustable and the shoulder protectors have Velcro adjustments. The padding is ok, but you'll want to wear a tee shirt under the deflector for comfort. Also a jersey over it to keep the shoulder pads from flopping around. Medium will fit now and you wont outgrow it in a year. Small... however the quality of this is amazing. If you buy a medium it will be a tad large for you however it will work fine and you will grow into it fast! You will use this product for years to come! I purchased one for my son when he was 13. He was 5 feet 6 inches tall and 115 pounds. We were able to adjust the fit and he said he barely noticed he was wearing it. My 11 year old son is 4'10" 87lbs 30" chest, seems to be right in the middle of youth and adult small and growing. what size is recommended? BEST ANSWER: I would go with the smaller size. You don't want the chest protector to move around on him. In this case snugger is better. Adult small. It may be big but you can adjust the straps along the sides to fit. I'd go with the adult. more coverage and he'll grow into by next summer watch. I would probably go with the adult small. I am 5'7 175 pounds what size would fit me best ? and would this fit with a with evs r4 koroyd neck brace ? BEST ANSWER: I usually wear xl in everything and mine is an xl. I wear this all the time, it does seem to ride up a bit. I pretty much use It on every ride though. I think with a neck brace, it might even help keep it down. Other then that it does real well, as far protection, if that helps any. The adult roost deflector and the neck brace is kinda a one-size fist almost all adults. I"m 5'10 185 and they both fit well together. This is my first neck brace to i don't have anything to compare it to but i'm comfortable wearing it and it feels good. I'm 5'10" , 170, and the large fits very well. I don't wear a neck brace. What neck braces fits this under jersey guard? BEST ANSWER: I Use the EVS R4 Neck brace with mine & its quite a Good Combo. I use the EVS R4.